Ander Herrera appears set to renew his contract at Manchester United, which would be great news for the club. There are some Manchester United players that fans cannot help but appreciate. In the current squad, there are a few names that spring to mind on this point, but perhaps no more so than Ander Herrera. The Spaniard has been at the heart of recent news speculation recently, as he looks destined to extend his current deal at the club. Despite interest from Athletic Bilbao, MEN are reporting that Herrera is keen to stay in Manchester. This news has been welcomed with open arms by the Man United fanbase, who will be delighted to see the feisty midfielder continue to chase down opponents at Old Trafford for the foreseeable future. Despite being a player who brings quality to the middle of the park, a lot of Herrera’s attributes relate to his persona off the field. As a man who recognises the importance of the badge on his chest, his love for United is a huge reason behind why so many fans are happy with this latest news. Since Ole Gunnar Solskjaer took charge, he has preferred to operate with the 4-3-3 formation, a system that has received praise due to the freedom that his attacking stars are now receiving. A large reason to why this freedom has been granted to those in the final third is because of the defensive security that Herrera offers. Operating as the RCM in the midfield three, the Spaniard’s duties rely with sweeping up the opposition’s attack and it is a role that he plays so efficiently. 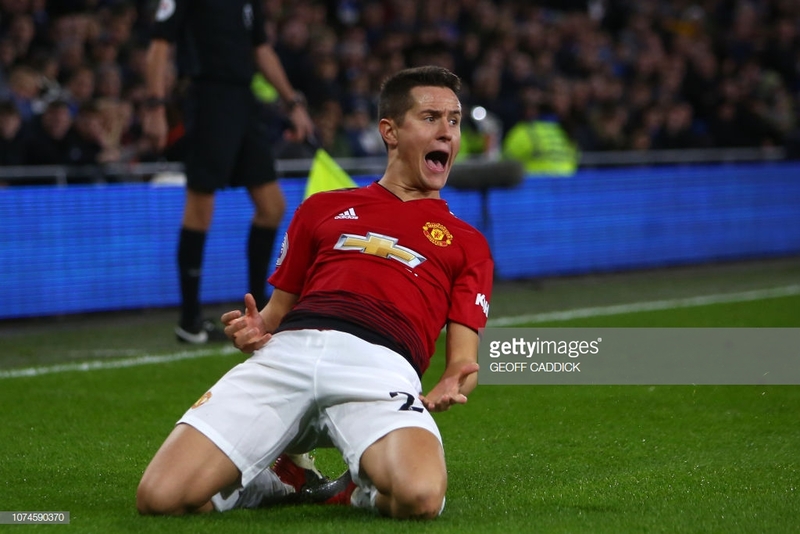 Fans have seen Herrera play in a similar sort of position under Jose Mourinho, where he was often deployed in the ‘big games’, usually in away fixtures. Being the hard-working and feisty figure that he is, the midfielder flourishes when ordered to press and thus creates a frantic environment for opposing midfielders to try and keep the ball in. Herrera’s presence on the field has also seemingly had an impact on Paul Pogba, who now finds himself in the no.10 position more frequently, as opposed to being the deep laying playmaker. When the Frenchman progresses forward, Herrera and Nemanja Matic will setup as a double pivot and provide their team with a defensive screen, to prevent an opponent’s counterattack. Given his Spanish roots, the midfielder’s technical ability on the ball is evident for all to see. Herrera’s high football IQ coincides with his style of play when the ball is at his feet, in the sense that he loves to distribute the ball across all areas across of the park. Able to operate in tight spaces, he often goes wide to form a triangle with Antonia Valencia and Juan Mata. By drawing opponents into this space, the two Spanish midfielders enjoy playing quick one-twos, before switching the play to the opposite flank. Under Solskjaer, Herrera’s distributing responsibilities have certainly been raised up a notch. In a system that encourages the wide men and lone striker to make constant runs in behind, the Spaniard has been tasked with the duty of releasing such players swiftly. From deep, Herrera is always effective in doing so, helping speed up United’s build up play in the process. The new Norwegian manager has quickly found a system that plays to his player’s strengths, with Herrera asserting himself as a key cog in the coach’s plans. It certainly isn’t a secret as to why Solskjaer wants the reliable midfielder to remain with the club, as he is such a useful tool for United to have at their disposal. A professional that is always prepared to play his heart out, whilst also possessing that required touch of quality on the ball, Herrera’s contract renewal is certainly a positive for the club.